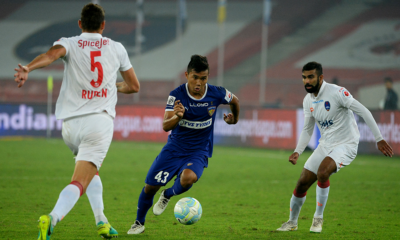 Sami Faizullah has a tactical look at Bengaluru FC and whether there is a cause for worry in midfield given the shift to a 4-4-2 from a 4-3-3 vs Dempo. When Bengaluru FC let go of Johnny Menyongar, plenty of the supporters gasped in disappointment. It wasn’t that the Liberian was a popular fan favourite (comparatively), but the fluidity with which he controlled the midfield left most viewers starring in awe. Coach Ashley Westwood replaced the 34-year-old Menyongar with Joshua Walker, ex-England U-21 captain. And as displayed in the sides’ maiden Federation Cup triumph, the 25-year-old seemed to struggle in the opening games but quickly asserted himself in the side and evidently was a step ahead at reading the game. But that victory in the final over Dempo also saw Walker come off early with an injury concern, later displaying an ice pack on his thigh. It was then no surprise that the ex-Middlesbrough youth product wasn’t named in the squad facing Dempo in the I-League opener. 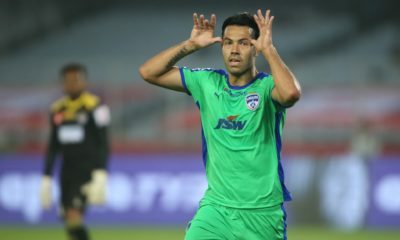 Instead, Westwood brought Robin Singh into the starting eleven with fellow star attackers Sean Rooney and captain Sunil Chhetri all playing from the kick-off. 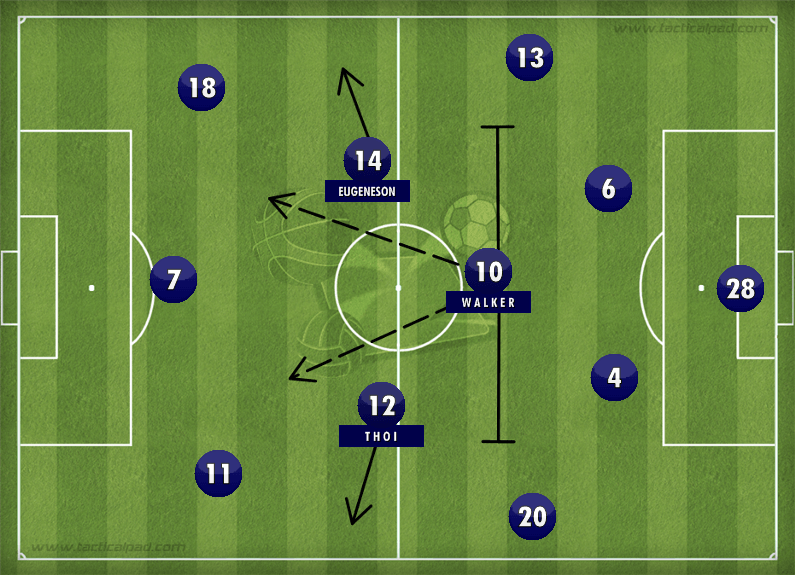 But rather than going with the regular formation of 4-3-3, Westwood opted to shift to a more traditional 4-4-2 that saw Sunil Chhetri drop into a role on the left wing as opposed to a spot in the front three. Sean Rooney and Robin Singh formed a strike partnership up ahead. With the 4-3-3 proving to be a dominating system at the Federation Cup, that firstly ensured maximum possession and an added benefit of playing the ball along the ground (as Westwood prefers), a shift way would most likely have been a forced change though also a possible response to Dempo’s strengths. Josh Walker’s absence meant neither of Siam Hangal, Thoi Singh, Eugeneson Lyngdoh or Darren Caldeira could be trusted to fit into the role played by Menyongar last season and Walker as his successor. Westwood opted instead to go with two central midfielders, providing cover to the other, with little to no defensive duties out wide. 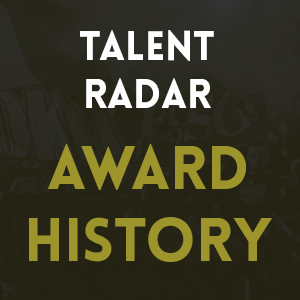 Thoi and Eugeneson were the chosen duo and though both put in a competent effort, there’s still a general belief that none of the midfield options in line after Josh Walker are capable of fitting into the deep central midfield role, resulting in a complete change of systems. The ex-United youngster turned coach stated that the change in formation came largely as a result of Dempo’s approach, suggesting that Bengaluru FC were cautious in their approach, focusing on not losing the opening game and conceding that it was a “pragmatic approach” but one that could possibly have worked if Sunil Chhetri had converted his penalty at the stroke of half, thus justifying the game plan. 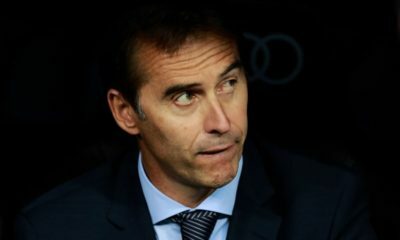 When further pressed into whether the other midfield options are capable of the ‘Menyongar role’, the coach further explained his faith in the squad. “There are a few who can play there, Euegenson [Lyngdoh], Darren [Caldeira] are capable while we’ve even played John Johnson there when needed last season. So as I mentioned, it was a combination of Dempo’s gameplay and Walker’s injury that sought the change in approach. 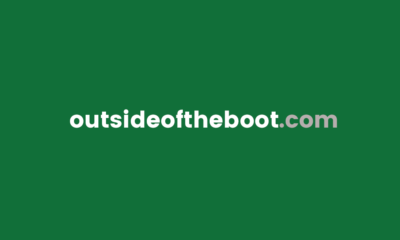 Others can come into that role, but this just wasn’t the game to do it in”, Ashley Westwood told Outside of the Boot. Although that midfield role does seem a bit of a liability in the absence of Walker, a change in system isn’t the biggest worry, particularly considering the fact that it worked well as a 4-4-2 (though not as effective as the 4-3-3). 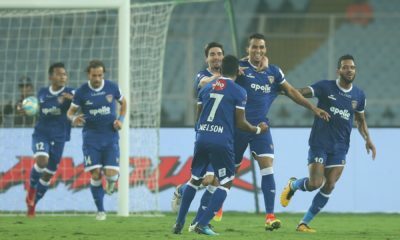 Dempo did a good job of ensuring the midfield battle went on how they preferred it to, with Artur Papas confirming to after the game that the tactic of pushing their midfield ahead in a bid to keep Bengaluru FC’s midfield as deep as possible was a preplanned approach. 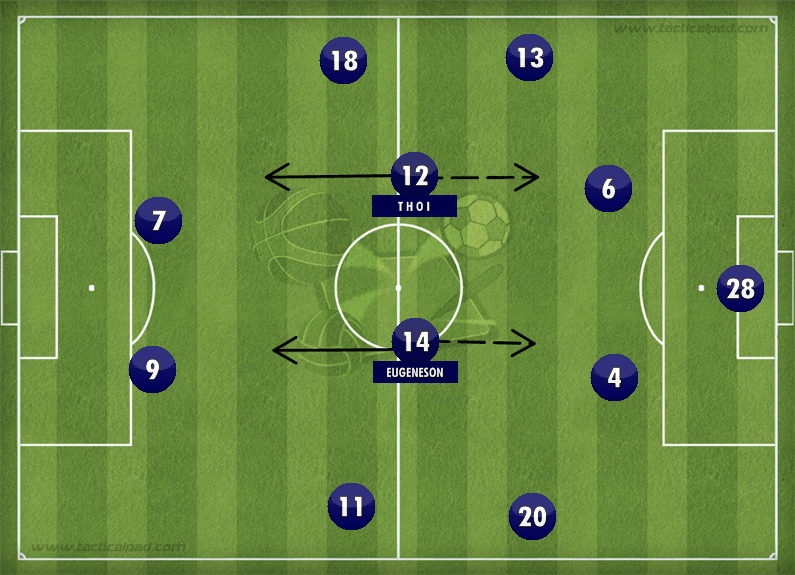 This approach ensured Bengaluru FC’s midfield were kept deep in defensive phases, widening the space between the two men upfront and forcing the home side into longer balls over the top. 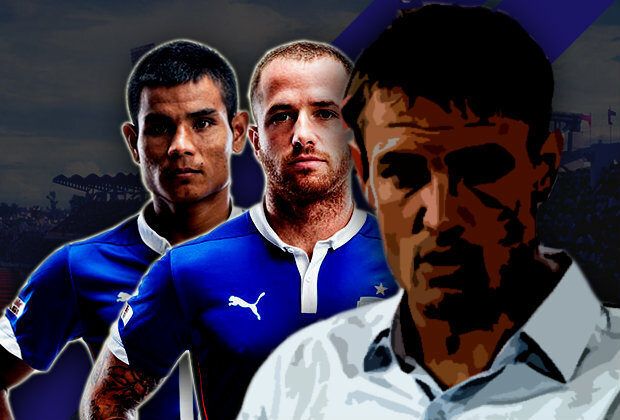 Both Sean Rooney and Robin Singh’s reluctance to drop deeper further helped Dempo’s case, going on to highlight the need for a player in that Menyongar role to control the tempo of the game and the battle in midfield. It’ll be interesting to see what approach Ashley Westwood goes with in the upcoming games as it would be unlike him to change a largely successful 4-3-3 approach to contain the opposition, though he has in recent games developed a strategy of cleverly seeing out games after taking a first half lead. 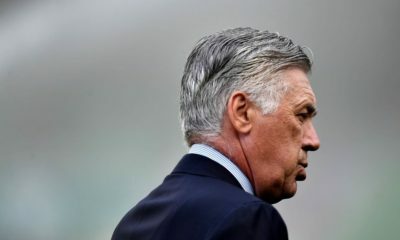 Similar cautiousness may not be beneficial in a league season, but could be applied for crucial continental fixtures in February. 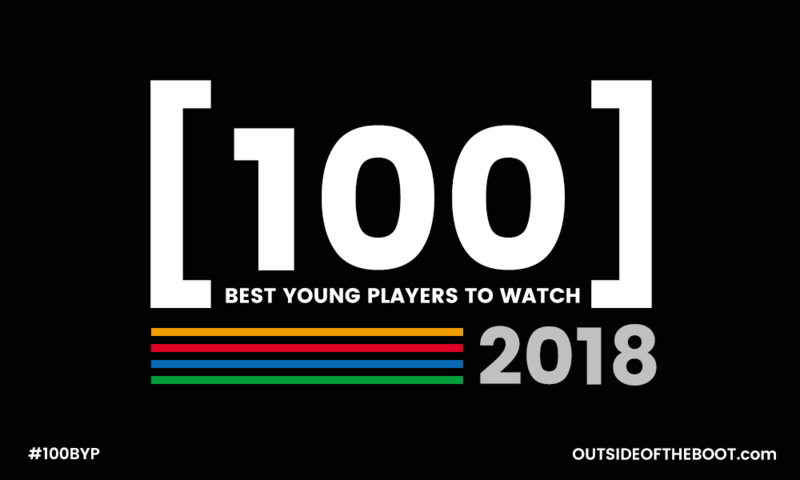 While the likes of Eugeneson Lyngdoh have been an exciting and promising injection to the defending champions, Talent Radar would love nothing more than to see one of the younger midfielders in Thoi Singh and Siam Hanghal fill into the void when the circumstances demand it.